The Milbank Memorial Fund is an endowed operating foundation that works to improve the health of populations by connecting leaders and decision makers with the best available evidence and experience. Founded in 1905, the Fund engages in nonpartisan analysis, collaboration, and communication on significant issues in health policy. and building communities of health policymakers to enhance their effectiveness. The Milbank Memorial Fund improves the health of populations by connecting leaders and decision makers with the best available evidence and experience. We envision communities made healthier using the best evidence and experience. We base all our work on the best possible evidence and experience—gathered, evaluated and synthesized—regardless of affiliation or ideology. We believe effective policies and programs emerge when individuals and groups with diverse views and backgrounds work together in a fashion marked by civil discourse and integrity that promotes trust. Improving population health must take into account the needs of entire populations, not just those with access to resources. 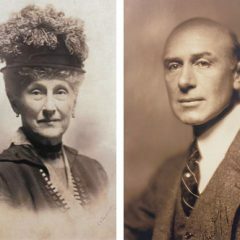 We are stewards of resources, always mindful of the effect of our programs, our investments and our conduct on future generations and the intent of our founders, Elizabeth Milbank Anderson and Albert G. Milbank. We work on important issues with achievable goals—where the evidence is strong and the practice is not. We believe leadership that is future-oriented, aware of the needs of many, inquisitive, principled, and pragmatic, is essential to improving population health. Continuously published since 1923, The Milbank Quarterly features peer-reviewed original research, policy review, and analysis from academics, clinicians, and policymakers. 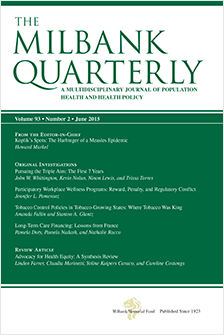 The Quarterly’s multidisciplinary approach and commitment to applying the best empirical research to practical policymaking offers in-depth assessments of the social, economic, historical, legal, and ethical dimensions of health and health care policy.